A Long Beach Island vacation home or duplex offers a break from the daily grind, but it can also offer a tax benefit. The tax law allows most owners to lower their taxable income by claiming tax deductions for vacation homes. What’s deductible depends on a number of factors, especially how often you visit and whether you allow renters. Don’t limit your notion of a Long Beach Island vacation home to a duplex or beach cottage. Even RVs and boats can count, as long as there are sleeping, cooking, and bathroom facilities. Tax deductions for vacation homes are complex, so consult a tax adviser. If you bought your LBI duplex or beach house exclusively for personal enjoyment, you can generally deduct your mortgage interest and real estate taxes, as you would on a primary residence. Use Schedule A to take the deductions. However, your deduction for state and local taxes paid is capped at $10,000 for 2018 through 20125. And the total amount of the mortgages for your first home and vacation home cannot exceed the $650,000 or $1 million amounts mentioned above. 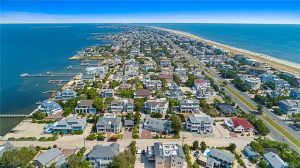 The tax law even allows you to rent out your Long Beach Island duplex or LBI single family home for up to 14 days a year without paying taxes on the rental income. You might be able to deduct any uninsured casualty losses too, if the home is located within a presidentially declared disaster area, though you can’t write off rental-related expenses. (More on those below.) If the home is rented for more than 14 days, you must claim the income. Now, if you own what you consider a LBI vacation home but never visit it, or only rent it out, other tax rules apply. Without personal use, the law considers the LBI home an investment or rental property. Time spent checking in on the house or making repairs doesn’t count as personal use. As an exclusive LBI beach rental, you can deduct numerous expenses including property taxes, insurance, mortgage interest, utilities, housekeeping, and repairs. Even towels and sheets can be deductible. Use Schedule E. You can also write off depreciation, the value lost due to the wear and tear a home experiences over time. The tax picture gets more complicated when in the same year you make personal use of your Long Beach Island beach house and rent it out for more than 14 days. Remember, rental income is tax-free only if you rent for 14 days or fewer. The key to maximizing deductions is keeping annual personal use of your LBI vacation duplex/home to fewer than 15 days or 10% of the total rental days, whichever is greater. In that case the vacation home can be treated as a rental, meaning you get the same generous deductions. To avoid going over the 10% limit, essentially you shouldn’t use your LBI vacation home more than one day for every 10 days you rent it. Make personal use of your duplex or home for more than 14 days (or more than 10% of the total rental days, if this is greater than 14 days), however, and your deductions may be limited. For example, suppose you rented your duplex or beach house for 180 days last year, you could use the home for up to 18 days of personal use before your deductions would be limited. Let’s say you have a Long Beach Island duplex property that you personally use for 25 days and rent for 75 days. That’s 100 total days of use, and it exceeds the greater of 14 days or 10% of the rental days. Therefore, your deductions are going to be limited in total and will also have to be allocated to personal and rental use by the ratio of time you rented the house compared with the total use. So you can only write off 75% of the expenses as rental expenses — 75 rental days divided by 100 total days of use works out to 75%. Some of the personal expenses, such as mortgage interest and real estate taxes, will still be deductible on Schedule A. If you are interested in purchasing your second home/vacation home on Long Beach Island, give us a call at 609-618-8390 or email us at team@lbiduplex.com. Article provided by HouseLogic.com. This article provides general information about tax laws and consequences, but shouldn’t be relied upon as tax or legal advice applicable to particular transactions or circumstances. Consult a tax professional for such advice.